Producing high quality sand from a variety of aggregate waste materials. From cone crusher byproduct, to virgin bank run river rock, the Rocky produces saleable sand product with near perfect spherical grain structure in just one pass. 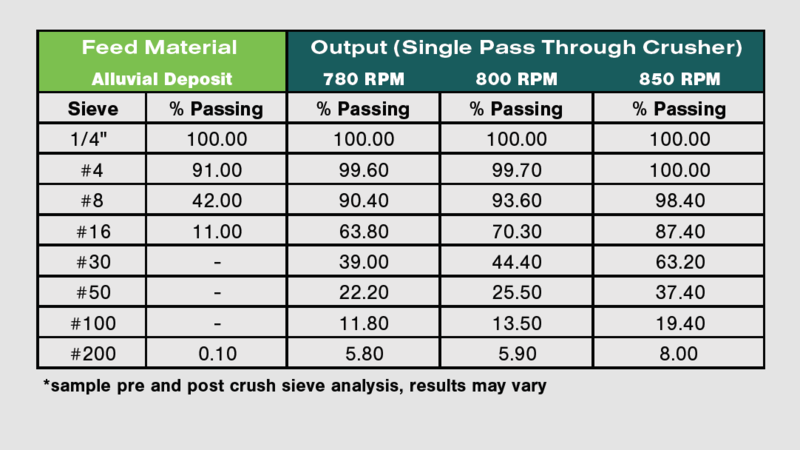 No grinding; No compression; Just 85-97% usable sand from a 100% impact crushing process. 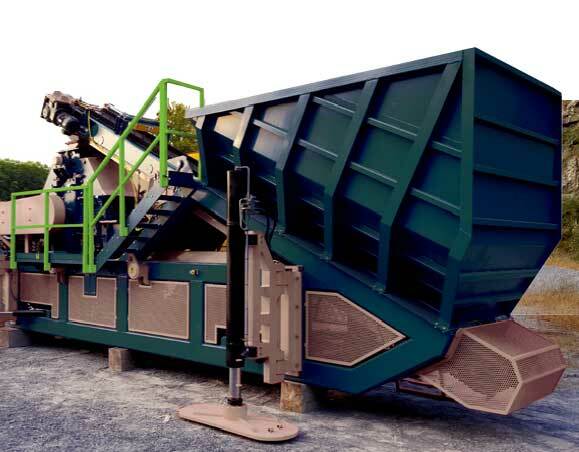 Capable of handling feed material from 5/64” to 1-3/8”, the RockyTM Sand Mill has a fully adjustable output gradation. By varying the RPM’s (with the addition of a motor inverter), the machine can yield a variety of sand grain sizes. Reduce the RPM’s to produce larger grain “fillers” and increase the RPMs to produce the finer “grit” size sand grains. Whichever the requirements of the job at hand may be, the RockyTM will produce, and the sand will always have a spherical grain structure and be 85% – 97% usable. The best part is, all of this is achieved with one pass through the machine with little or no material re-circulation necessary. Featuring a double horizontal shaft rotor design, the RockyTM Sand Mill eliminates the need to adjust its aprons. In similar machines, increased abrasion and the premature wear of apron liners results after operators “close or tighten” the unit’s aprons, changing the approach angle of the material being crushed. The RockyTM, however, maintains a uniform shape and wear factor of all working parts involved in the crushing process. Another useful feature of the RockyTM Sand Mill is that it’s able to take misshapen sand produced from hi-speed cones and crush them again into a more uniform shape and size, ideal for jobs with even the most strict quality control regulations. The RockyTM may look small, but when compared to its competition, with a driving power of 160KW, the RockyTM Sand Mill packs quite a punch. Controlled by an easy to navigate touch screen (RockyTM Truck Model), the machine is the answer to many problems in the crushing, mining, and manufactured sand industries. With manufactured sand this good, the possibilities are endless. All internal parts involved in the crushing process are a cast FX25 alloy, also known as 25% High Chrome White Iron. These alloys have an extremely high resistance to wear and abrasion. With the combination of a lifetime of research and development, the highest quality alloys, and superior engineering science, the Rocky provides the best wear properties, sand quality, and cost effectiveness of any machine in its class.